HYDROS-M is powered by a safe, storable, and non-toxic ‘green’ propellant – water – which is electrolyzed on orbit to deliver high performance bipropellant propulsion. HYDROS is a novel high-TRL propulsion architecture that uses a hybrid electrical/chemical scheme to provide small spacecraft with both high thrust and high Isp propulsion. 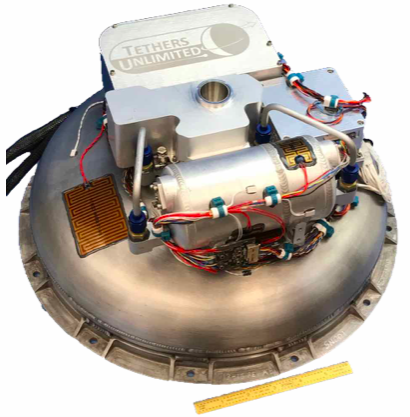 HYDROS propulsion systems enable secondary payloads to perform missions requiring orbit agility and large DVs while launching with the ultimate ‘green’ propellant: water. Once on orbit the HYDROS system splits the water propellant using electrical power to produce hydrogen and oxygen gas which is then combusted in a bipropellant thruster.